Knowing where to start when it comes to choosing the perfect cake for your wedding day can seem like a bit of a mission! 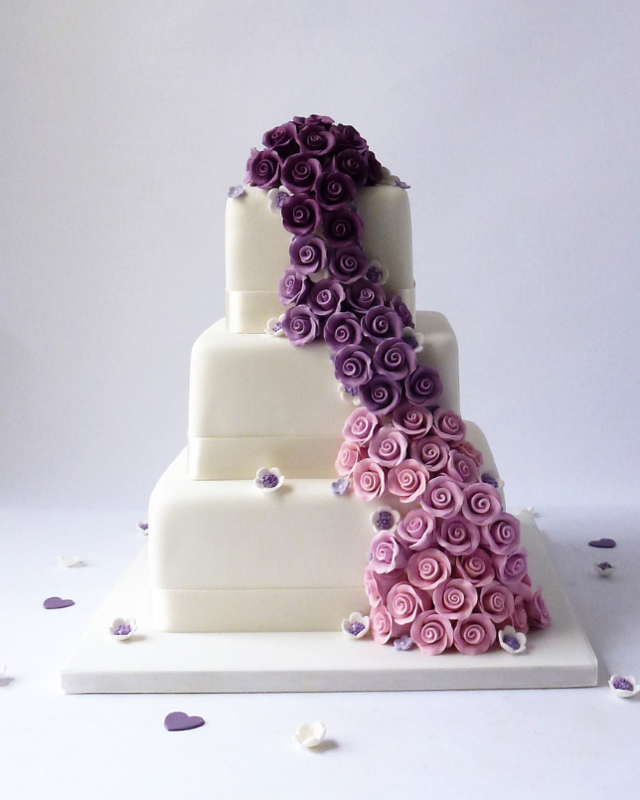 I’ve worked with hundreds of couples over the last 30 years creating their dream cake, this means I’ve learnt how to make the process as stress free as possible. So here are my tips on how to break it down into 9 simple steps. Taste matters – first things first, the cake flavour and taste are important! The idea is you and your guest should eat and enjoy the cake so make sure you always sample the various types and flavours on offer. At Karen’s cakes we always freshly bake and never freeze our cakes, we believe in sticking to classic flavours that cut well and are crowd pleasers, Vanilla Genoese, Lemon Twist, Orange Grandeur, Coffee and Walnut, Belgian Chocolate Cake, Red Velvet with White Chocolate Buttercream, (Victoria Sandwich gluten/wheat free and only available for semi-naked and buttercreamed cakes) Traditional Rich Fruit and Luxurious Wedding Fruit. We recommend 2 flavours as more can complicate the issue, although we do of course do more if our couples want this. 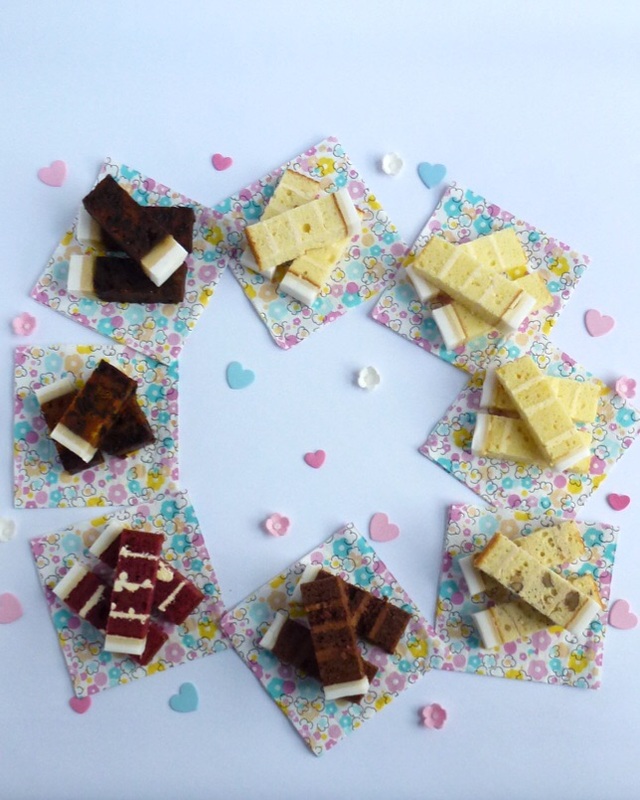 Choosing to have multiple flavours also means the whole cake would be cut even if the cake portions were not needed as well as possibly disappointing your guest if one of the flavours runs out. TIP Try before you order, ask is it fresh or frozen, should the completed cake it be kept in or out of a fridge, it’s keeping qualities. 2. Real or fantasy – When deciding who you ask to make your cake make sure you see the quality of their work in reality, either as a sample dummy cake/s or good quality photographs. A recommendation is advisable from someone you trust. If the design you would like is based on a picture or sketch make sure your chosen cake maker is able to forfill the brief. TIP Seeing is believing, make sure you do your research! 3. 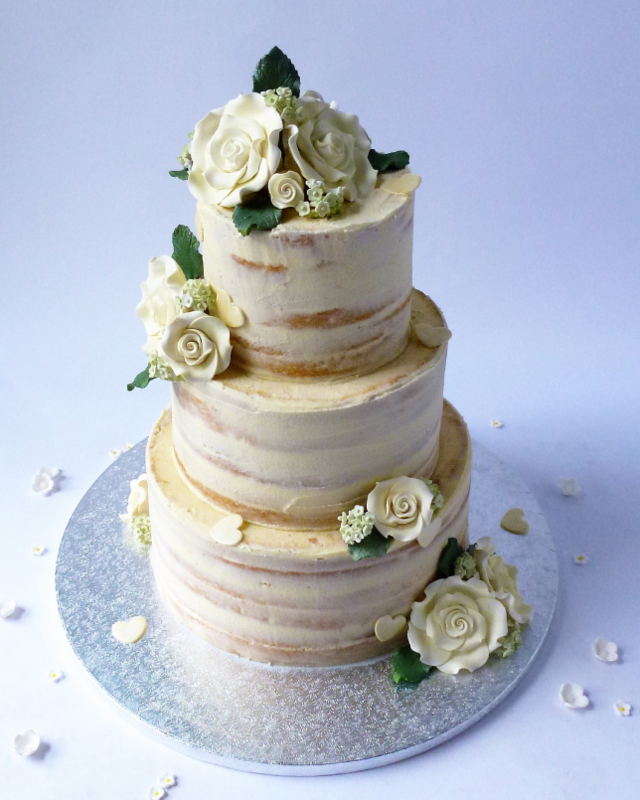 To have or have not – In these days of anything goes there is the choice of cakes with or without traditional icing in the form of fondant, royal icing or buttercream, ‘without’ cakes are described as naked or semi-naked cakes. The looks are very different, ‘without’ is casual and informal, ‘with’ is timeless and allows more options to incorporate your personal wedding styling We do not make naked cakes as we believe to be at their best they need to be baked no earlier than the day before the wedding, preferably on the day, delivered and assembled on site and displayed for as sorter time as possible to prevent the cakes drying out, this is not something we can schedule into our busy bakery work load. Semi-naked cakes have a thin skim coat of fresh buttercream that beautifully marries 2 important jobs together, firstly it gives an extra bit of stability to the structure of the cake making it much safer for transportation and adding decorations to, secondly it helps to prevent the otherwise exposed cake from drying out.TIP Don’t choose a semi-naked cake just because you don’t like icing, choose it because you love the look! 4. Size matters! 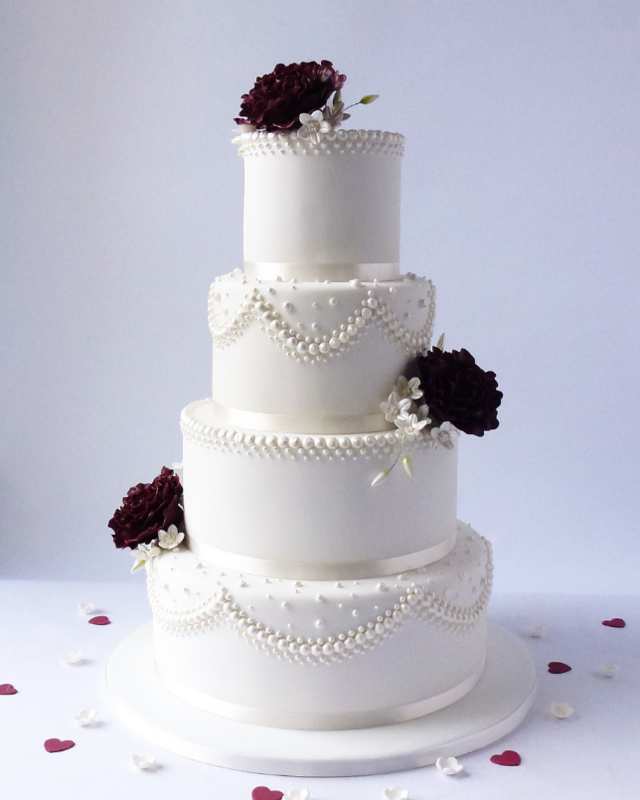 The number of portions needed does not necessarily dictate the size of cake or number of tiers you end up with, there are other things to consider before making that decision, how and when the cake is being served, the size of a ‘portion’, if you want to keep a tier, room/venue size together with where the cake will be displayed are all factors worth thinking about. Firstly, when to serve? The traditional British style wedding custom was to serve cake after the Wedding Breakfast, (so named as it was the first meal taken together as a married couple) as the last course with coffee. In recent times many couples will have additional evening guest, so it is becoming more popular to preform the cake cutting ceremony in the evening before the first dance rather than earlier in the day but in either case it is best to cater for the majority of your guest remembering some may not want a piece. Another option is to serve the cake as dessert, in this case the cake portion size often needs to be larger, so bear that in mind. The size of the room is worth considering, in a grand venue bigger is best, an intimate restaurant would suit something more understated. TIP An experienced cake maker will help decide what is right for you taking into account all of the above as well as your budget. 5. Is it real – Some of the tiers cake be ‘mock’, in other words, polystyrene blocks that are decorated to match the rest of the cake. 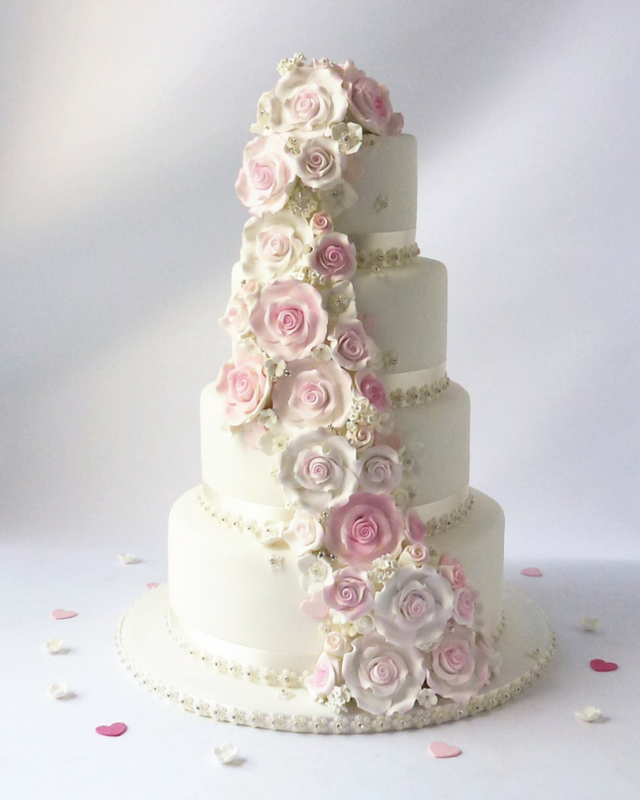 We do this as standard for our ‘Showstopper Collection’ designs because of weight issues created if all 5 tiers were made from cake, basically I would not be able to pick the cake up! 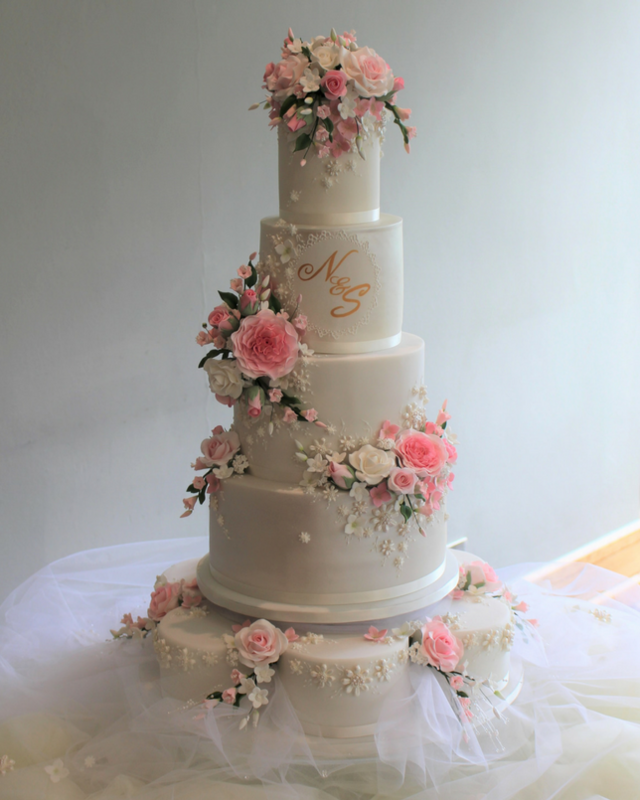 Mock tiers can also be used to cut down on the number of portions of cake whilst still creating the elusion of height and grandeur but a word of warning, whilst it should reduce the cost remember the main expense is in the time and skill required to decorate the cake so do not expect vast savings. TIP Consider mock tiers carefully, sometimes they are essential, other times it may be false economy. 6.Things are shaping up – hopefully you’ve now got an idea about the flavours, coating type, how and when you are going to serve the cake and the size, next its the shape. Whilst there are lots of different shapes you could have, unless there is some burning reason why you would like to have an usual shape I would recommend sticking to round of square. The possibilities with these 2 shapes alone are endless, so why make the choice even harder for yourself! However I beg you, if you choose a square design do it because you like it and not because its easier to cut or you get a few more portions! TIP Make your choice based on the design not cutting or portion quantities. 7. 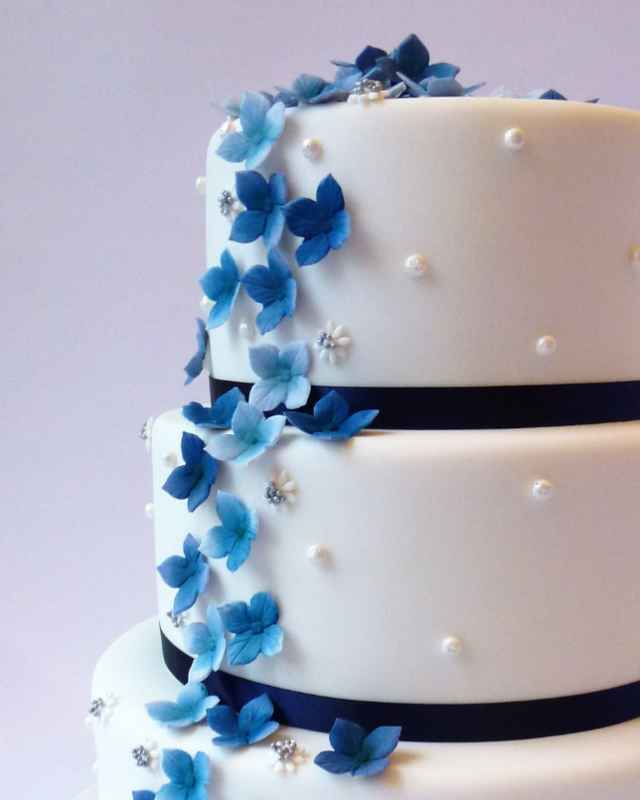 Wedding colour scheme – Incorporating a colour scheme into a wedding cake can be a bit of a challenge sometimes, getting the balance and colour right is not as simple as you may think. Strong non-floral colours need to be introduced either with caution or used as statement, for instance in the coating colour. Some colours are near impossible to achieve in food safe colours, these include vibrant colours like royal blue and fuchsia, so don’t expect a perfect match, accept that in some cases it may have to be a near version. Metallic colours are also a challenge, these require either a spray paint, hand painting, special types of sprinkles or gold or silver leaf to create. I make up colour samples when couples are ordering if something specific is request so that we all know exactly what can and can’t be done. TIP Strong colours draw the eye, it’s often a case of less is more. 8. Let’s get personal – Monograms on cakes have long been popular as have model couples, it’s a way to add something unique to you but there are other things you can add including toppers specifically made for you to order. Remember to make sure the topper will fit your cake and advise your cake maker you are having one, preferably giving it to them before the cake is completed to add as needed. TIP Order toppers early and let your cake maker know. 9. 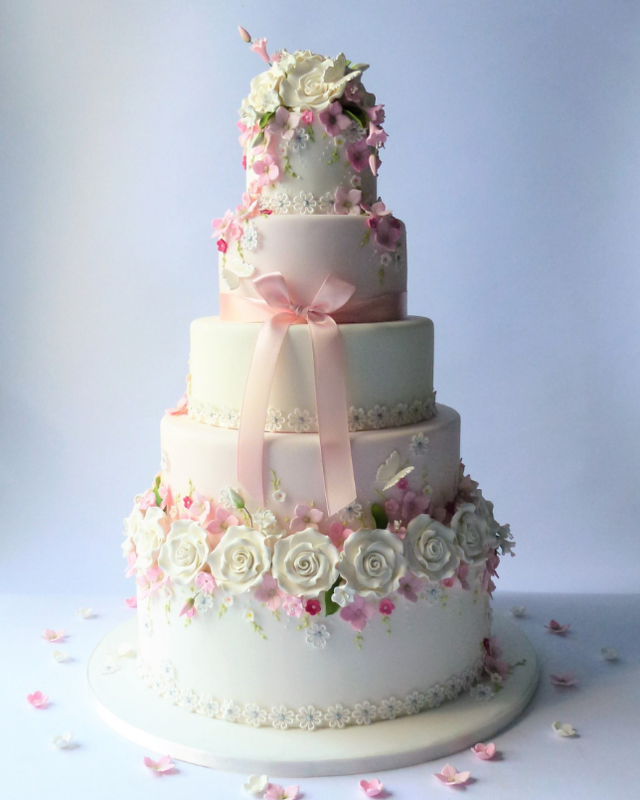 Just for you – I know is lovely to have something specifically designed and created for you, we all want our day to be as unique as possible but a word of caution, of all the options you can take when choosing your wedding cake, this has to be by far and away the most expensive and potentially disastrous route to take and here’s why! Absolutely anything that is a handmade one off takes a lot of time and effort both in the design process and it’s excision. The creator has to factor those cost and this will be reflected in the price, couple this with delving into the unknown of the designers skills, its is shall we say, a path less travelled but if you do go that route use the following to guide you! When choosing your cake maker think of it in the same way you would choose a restaurant, if you wanted an Indian meal you would not go into a Mexican restaurant and try to order a curry! They may rustle something up but it probably won’t be as you’d hoped! 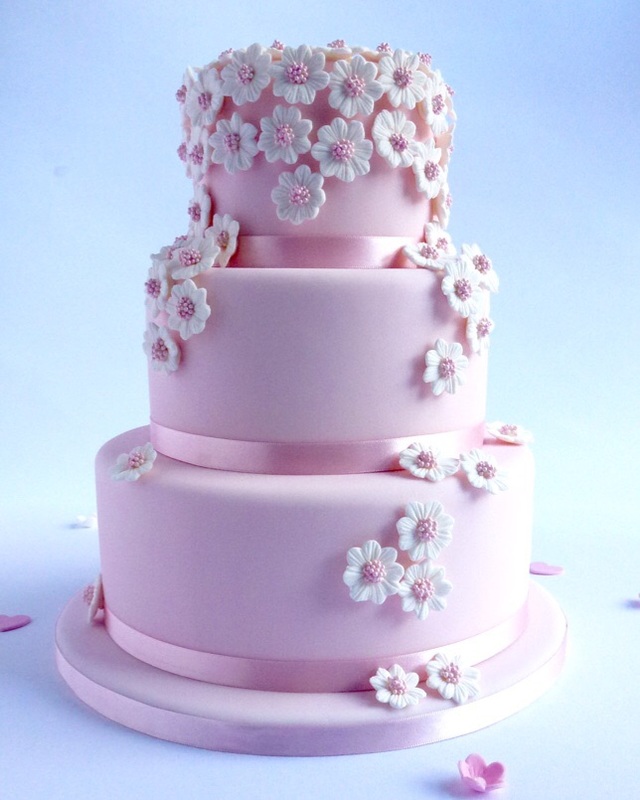 Cake makers usually have particular skill sets in the same way a chef does, pick your cake maker based on the skills you can see they have and choose your unique design based around that. TIP Don’t let your wedding cake be an experiment in a cake makers learning curve no matter how enthusiastic they seem! 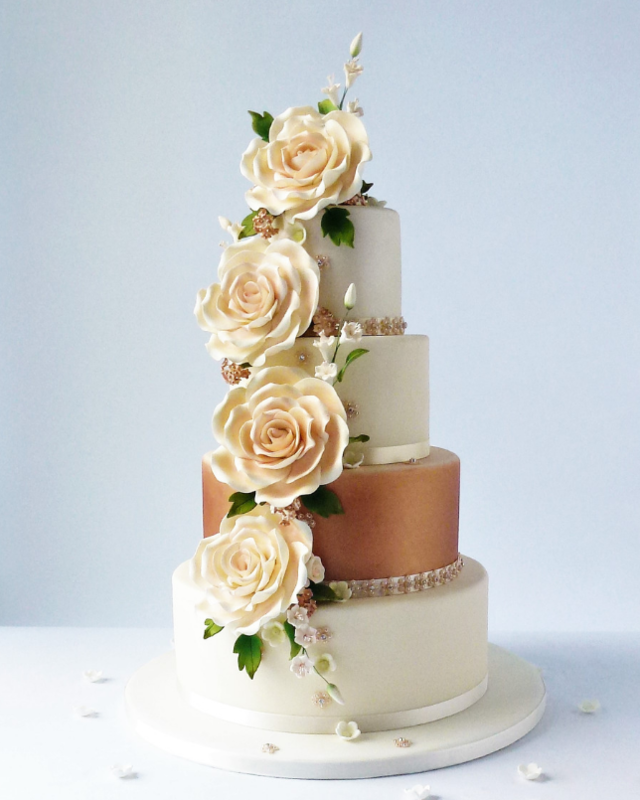 Lastly a word about our wedding cake collections, every cake you can see on our website is made by us and in many cases they are real cakes created for some ones special occasion. 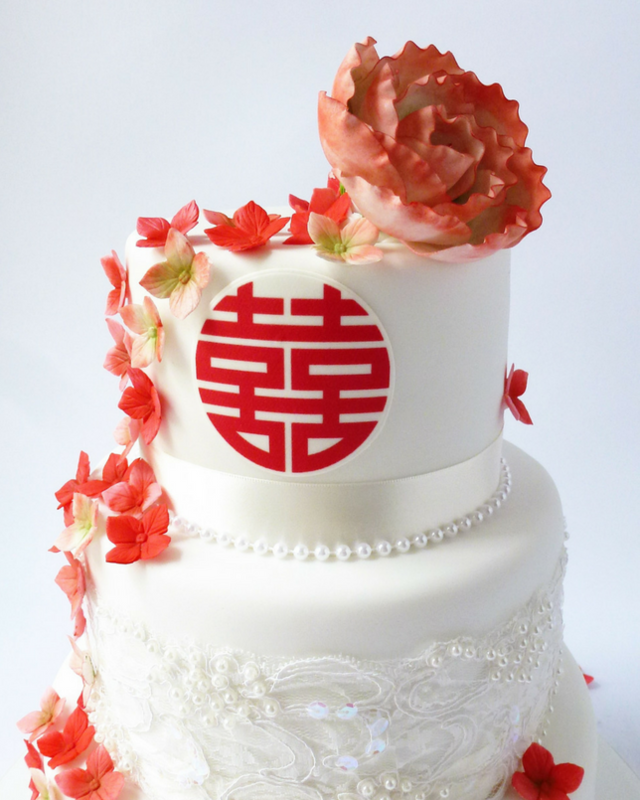 Every cake be personalised by filling in the drop down boxes in the ‘Order your cake’ section on each design page, including the size, flavours and colours. The prices are displayed once the boxes are completed, you can even place your order via our website! But if you would prefer to see us and our cakes in the flesh we’d love to see you at our high street shop in Bishops Stortford, just give us a call to make an appointment.